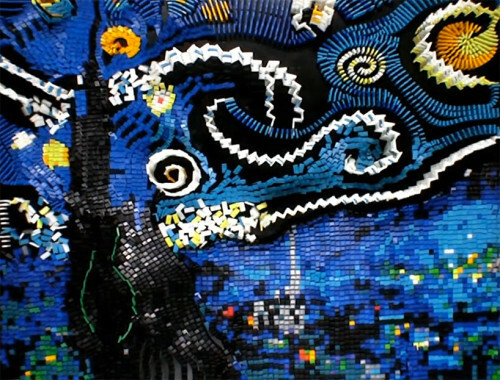 Recreated from 7,000 dominoes, this Vincent van Gogh’s “Starry Night” turned out realistic and beautiful. 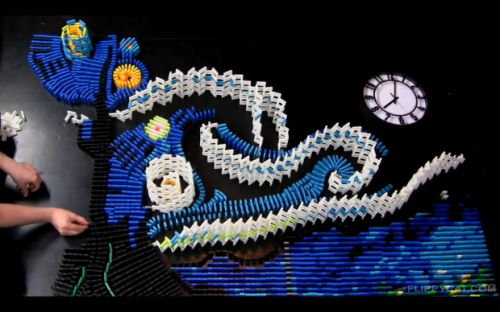 Meanwhile, this is the second attempt of the domino artist and the author of the project FlippyCat. In fact, it took him about 11 hours total to build the creative project, plus the time for a failed first attempt. 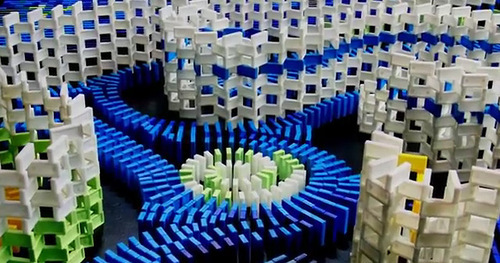 After constructing the entire work with carefully arranged, aligned, and stacked dominoes in a three-dimensional configuration, flippycat initiated a domino chain reaction. In particular, with a leading line of grey pieces, causing all the dominoes to fall in a cascade and turn the pixel-like assemblage into a more impressionistic recreation. FlippyCat explains that “There were 2 small breaks in the fall of this project. I did not complete the leading grey line and left out a domino which stopped the reaction in the bottom. The star that is left standing was very close to falling, but the first domino held in place.